Secondary Objective: Pirates caught between A Rock and a Hard Place? Sky high talent: Magz is the cornerstone of a the DB rebuild in 2012. If you were going to lose three starting defensive backs off of the 2011 team, as good as they each were, the three right guys left. With free safety Damon Magazu returning, Defensive Coordinator and DBs Coach Brian Mitchell has a heck of a Rock to build his secondary around. Unfortunately, if he does not get a lot of that building done this spring, the defense could find themselves in a Hard Place in the fall. In between now and then, the Pirates must forge a set of four that can complement what looks to be an outstanding front seven. Magz is a leader in the back and will tremendously help a cast of JUCOs, a couple of guys who have been it the system for a while and maybe a notable frosh or two gel into a unit. The question is, how effective will the unit be in 2012…will they get picked on? Will they be an Achilles Heel? Can the team replace the likes of Emanuel Davis, Derek Blacknall, and Bradley Jacobs? Mitchell and company have said that they believe they will be two-deep at every position come fall and two-deep with quality, which is the key. The coaches certainly went after the position big-time in the off-season – in part due to the unexpected loss of rising talent Rahkeem Morgan, who left the program – bringing in a slew of talented corners and a grabbed one of the nation’s top safety prospects. The makings may be there. Experienced corner: Jenkins returns a ton of game-experience to the competition. There are a lot of name there, so let’s dive in and see which ones are likely to surface into the depth chart by end of spring and heading into the fall battles. Desi Brown: Though he started off the 2011 season kind of a bit lost when he finally saw game time, Brown didn’t finish the season that way. By end of 2011, he was pushing hard for more and more time at the strong safety position during practice and in the four games he saw action, he improved with every snap. Brown is a big-bodied safety at 6-2, 200 pounds and is getting time at OLB in camp as well, so it remains to be seen where he ends up. He has a QB’s football IQ (having been a star QB in high school), but could fill into his frame and be a very good linebacker as well. Seeing that the staff slotted him at No. 3 in the strong safety DC in spring, may give an indication that the “test” at OLB is more of a longer term plan; hence Brown may not be a safety any longer come fall. Nonetheless, he can play the position and for this preview is still sitting at safety. Prediction: Brown will get reps at safety for insurance purposes. More likely, he will grow into an OLB, clearing the room for some younger guys to get on the DC at SS (perhaps a Lucas Thompson or some other younger guy). If he stays at SS, Brown will likely be an “OR” No. 2 or a No. 3 coming out of camp. Lamar Ivey: Ivey emerged in 2011 as a viable SS safety for the Pirates and started so well that he was pushing former starter Bradley Jacobs for the job outright. However, late in the season, like many freshman, Ivey sort of hit the wall and his level of consistency and intensity dropped off. He contributed 6 tackles in 10 games. He is a rangy safety at 6-1 and is athletic. He comes into spring knowing that the vacated job is open for the taking and he knows that Mitchell does not intend to hand him the job, considering that the DC brought in a ready-to-play JUCO. Ivey has the toolset and now has a year of experience to bring to the challenge. Prediction: Ivey is a gamer and will battle for the job. He will likely end camp as an “OR” No. 1 or a No. 2 at the SS position. Dominique Lennon: Patience will be the name of Lennon’s game this spring and in 2012, barring any injuries ahead of him at free safety. He is a gifted player and has enviable measurables. At 6-2, 200 pounds, and high athleticism, he is definitely being groomed for the position. However, with Magz entrenched at starter and Justin Venable a savvy backup in the role, Lennon will have to wait it out. He will make a run at Venable some in the spring, but his mission is to become the next rock in the back. Prediction: Lennon will have a nice camp, but will exit where he started, at No. 3 at the FS position. He could end up an “OR” at No. 2, depending on how he performs. Damon Magazu: Mitchell calls him his “Rock” and there is good reason for it. The minute Pirate fans got a look at him on the field as a true freshman, it was obvious he was a special talent. The kid is simply a football player through-and-through and just seems to come up with big play after big play. He can hit, he can run with receivers, and clearly has a nose for the football…and, he’s just a junior. In 2011, he was 2nd on the team in tackles with 80 and he lead the team in INTs with 4 to go along with a PBU and 3 fumble recoveries. He is the unquestioned leader in the secondary this time around (though he has been a leader since his frosh year) and he raises the bar for his teammates around him. And, he is likely to be on a mission this season, noting that the Pirates simply did not generate enough turnovers, INTs particularly. Prediction: It would take something strange for Magz not to be sitting atop the FS depth chart coming out of spring and heading into the fall. Justin Venable: You just can’t help but really like Venable. He’s a guy who puts in 110% and does so to be a role player. Now, he plays a very important role in the secondary, so that is not to discount that. As Magz’s primary back-up, he is expected to come in and prevent any drop-off in play and did well in that capacity a year ago (8 tackles, 1 PBU). He is a good FS and part of what Mitchell is touting as “quality” depth, not just a body behind the starter. Lennon could push Venable a little in camp, but that will only serve to prime Venable for what will prove to be a big year for the senior. Prediction: Venable will be a solid No. 2 at FS, or maybe, if Lennon has a great camp, an “OR” No. 2. Very likely that Venable will see plenty of action as a primary reserve for Magz. Godfrey Thompson: A testament to what a player Thompson is, is the fact that the Pirates didn’t really recruit him hard at first. The coaches were zeroed in on his teammate and fellow Pirate DB Adonis Armstrong when then were distracted by this other guy in the back there for Hinds CC. Thompson was impressive at Hinds in his role as a hard-hitting, rangy Strong Safety and with the spot wide open at ECU, the fit was perfect. In Thompson, the Pirates get a game-ready SS that they hope can win the job in the spring. Thompson did the work and got into the fold in January so he could compete for the job in the spring, so chances are he will get a ton of reps to see if he can make the transition from Hinds to big time collegiate football. Prediction: Thompson will battle hard and is likely to come out of the battle as the No. 1 SS or an “OR” at No. 1. Jacobi Jenkins: The good news for Jenkins is that he understands the position he is battling for and has a lot of game experience over at the Field Corner position. Perhaps bad news, the coaches went out and brought in a pair of highly-regarded JUCO corners this season to battle for the position. Still, Jenkins is a gamer and one of Mithcell’s favorites in the secondary for his work ethic. The converted wide receiver has been a regular contributor at corner for two seasons now, registering 15 tackles and 4 PBUs a year ago. Jenkins will battle hard in the spring. Prediction: Jenkins will finish camp as either the No. 1, an “OR” No. 1 or No. 2 Field Corner on the roster. Emotional leader: Paulk is a fiery player ready for Prime Time. Leonard Paulk: Over on the Boundary Corner side is a corner who has worked himself into a prime position to step into a starting role. He is a verbal leader in the secondary and has a rep for getting after it. He performed admirably a year ago, most noteworthy, in filling in as a starter for a benched Emanuel Davis against highly-regarded USC last year. He finished the season with 28 tackles and a QB hurry in reserve action a year ago. He is a very physical player and marksman of a tackler who Mitchell expects to have a big, big season for the Pirates. Prediction: Paulk should exit camp this spring as the No. 1 at the Boundary Corner position with perhaps a battle in the fall with an incoming JUCO. Cody Lyon: A transfer defensive back from Campbell, Lyon cut his teeth for the Pirates on special teams a year ago where he registered 3 tackles. A bit undersized in the current corps of defensive backs, Lyon is a senior and is a heady player. He is most likely to emerge as a special teams leader – which is critical needed role on the kick coverage units – and ace while he battles to pick up whatever reps he can get at a secondary position. Prediction: Lyon is not likely to garner a depth chart position coming out of the spring. From Nickel to full-time: Sykes will battle to expand his on-field role in 2012. Kris Sykes: Sykes saw a bunch of playing time a year ago almost exclusively in Nickel situations and made a very good accounting of himself with 11 tackles and a 4 PBUs. Mitchell loves his attitude – a go getter who will do anything to help the team – and saw a kid whose learning curve was sharp given that 2011 was his first collegiate football experience despite being a junior. He has, as Mitchell put it, earned a shot at the Field Corner position. Sykes has proven to be a solid Nickel back and will compete hard for a regular position in camp and into the fall. Prediction: Sykes will likely fall short of gaining the No. 1 spot on the depth chart and could end up as No. 3, but he will factor into the line-up for sure in the 2012 season. Adonis Armstrong: One of the JUCOs brought in to battle for the corner postions, Armstrong saw to it that he arrived in the spring in order to get a jump on his ECU progression. At Hinds CC, he was one of the nations’ best JUCO corners, finishing among the leaders in interceptions with 7 and proved to be deadly with the pick as he piled up the Pick 6s in 2011. He is a superior athlete – also a kick returner – and is game ready. Armstrong came to ECU to start and because of this, Jenkins needs to be geared up for a battle because that is what he is going to get from Armstrong. Prediction: Armstrong will battle hard and will finish camp as a No. 1 or a No. 2 at the Field Corner position. The battle at FC will go deep into the fall. Doug Mayo-Tapp: As a junior, Mayo-Tapp finds himself finally in the mix at one of the DB positions, rating a depth chart position heading into the spring at the Boundary Corner position. What this means for Mayo-Tapp is that he has defined himself enough to be slotted into a position and will get reps in the spring to see if he can stick there. Prediction: Mayo-Tapp has a chance to push up a little on the chart, leveraging time in the program, but it is not likely he will come out of camp higher than a No. 3 spot on the DC at BC. And, he will have to battle hard to hold on in the fall when all of the DBs are in camp. Detric Allen: Mitchell has said that he is very excited to see how Allen performs in camp this year. It is Allen’s second spring camp and according to Mitchell, he has demonstrated that he understands the scheme well. He is a big-bodied corner with a physical style which slots him perfectly for the Boundary Corner position. Allen will push Paulk, though he does not yet possess the experience and polish that Paulk has. That said, spring is for Allen to solidify himself as a ready reserve and establish himself in the BC succession plan. Prediction: Allen is likely to come out of spring just as he went in, as the No. 2 at BC but it should be a solid, solid No. 2. He will have to continue to keep up the work in the fall to maintain it, but he is skilled and ready for the challenge. Rocco Scarfone: Mitchell has given Scarfone high praise in comparing him to Magazu in his style of play and football IQ. Scarfone can play any of the four positions on the field but Mitchell wants him to start out focused on the Field Corner position. There is not a big expectation for Scarfone to be a regular in the secondary this season, but to go through reps at FC should prepare him for time there and at safety if need be. 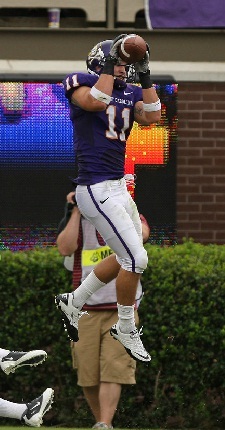 Expect Scarfone to compete well there as he sets himself up to be a big part of the special teams rebuild in 2012. Prediction: Scarfone has a lot of talent ahead of him at the FC position, so he may have a great camp, but still come out at No. 4 on the DC at FC. That will be a solid camp accomplishment for the young DB and will position him well as he works through the system. Joshua Hawkins: To many, seeing Hawkins on the depth chart at BC in the No. 3 slot heading into spring might be a surprise, but a little digging into Hawkins’ past may reveal why the staff has invested in this walk-on from Glen high school. In high school Hawkins was an outstanding running back, earning all area selection two years in a row and a place on the East-West all star game. 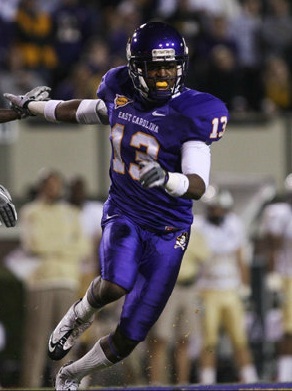 During his redshirt season in 2011, Hawkins demonstrated a supreme work ethic demonstrating that he is a hungry football player who wants to play at ECU. He has good size at 5-10 and a 180 pounds and is a very physical player. He has learned the corner position and will compete hard in camp. Prediction: When a player has big-time want power, you cannot count him out of a battle and for this reason, Hawkins could finish where he has started, at No. 3 on the DC at spring’s end. 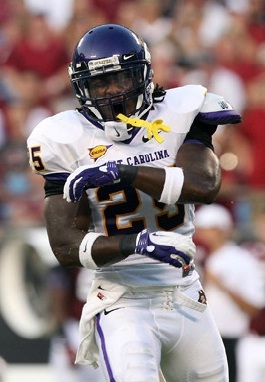 Look for Hawkins to further define himself as an active and important member of the special teams units in 2012. Glenn Hilliard: Hilliard came into ECU as a very-highly touted corner, ranked by some services among the nation’s top-40 corners. He has struggled some with injuries and was listed as limited/out for spring camp this year with a knee injury which he is rehabbing. He is highly talented and can play either corner position as he was a proven tackler in HS but also was a big play guy with an ability for blanket coverage and the big INT. Hilliard will need the fall to establish himself in a position going forward. Prediction: Hilliard is not likely to be on the post-camp depth chart, but will compete once he is healthy. Greg Robinson: Robinson is a walk-on who fits the mold for success on the walk-on path. He is a former successful high school quarterback – in fact he was not only a good QB but also showed talent at WR for Fayetteville Seventy-First HS. Typically, converted QBs do well when they move to DB because they have high football IQs, an understanding of what the corner position does, and typically have very good skills. Robinson is still learning the defensive back position as a freshman, so spring will be a learning experience as he works toward a scholarship. Prediction: Robinson is not likely to be on the depth chart at the end of the camp, but could vie for special teams work. I have enjoyed reading your columns in the past. I have also enjoyed this site and reading your thoughts this spring. I may be in the minority on this (and late to the party), but I think that the graduation of Davis will not be as big of a hole to fill. 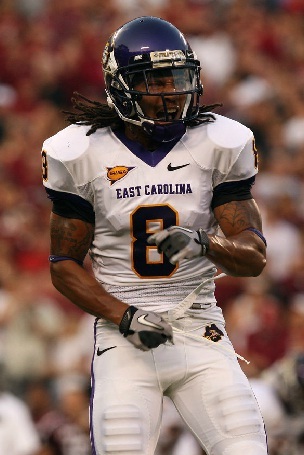 While he was a quality DB during his time, I think that the front 7 during his first two years made him a much better DB, just like any of the other secondary players during those great years for ECU defense. ED’s junior year was just a nightmare across the board for that entire unit. Last year’s improvement was substantial which we all wanted to see. Due to ED’s success early, many opposing offenses went away from him, but I still have the second half of the Navy game burned into my retinas. He was repeatedly caught looking in the backfield and gave up one long TD pass and then was outjumped at the end of the game for what looked to be the game winning touchdown. I still don’t know how the replay kept that from being a touchdown. I really liked what I saw from Desi Brown (and the LB Bigger) at the spring game. You have listed a great group of secondary players that can provide immediate impact this fall starting with Magazu. He really does have a way of being around the ball, especially in the red zone. Hopefully this group of Pirates can increase the number of interceptions this fall. Thanks again for your insight. I look forward to more and to the start of football season! Thanks for sharing your thoughts Hank and for taking the time to read. One thing I really like about the group we have is that there is a good mix of experience and athleticism. Looking at the post-spring DC (which I am not allowed to post en masse) we are looking at we have a great battle going between Jenkins and Armstrong at the field corner with Paulk locked in at Boundary (though we are inexperienced beyond him). Magz…just makes you field like you are super solid at FS and I think Venable had a nice camp too. The surprise – in my opinion – is that Desi is down at the bottom of the SS DC. I don’t know if it is because the staff is on the fence with him between SS and OLB or not, but I too thought he had a nice camp. We’ll see. If the front 7 delivers…this group is good enough to make the defense look stellar. If, if if…God I can’t wait for the season. Do you have any plans to comment on the implications of the 4 team playoff the BCS appears to be going to? Hi Ed…between the BCS BS and the Conference USA situation…I really do not know which to start with. 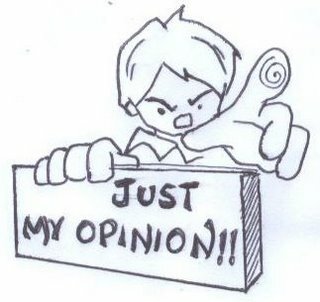 I will though and would love to hear others thoughts on it. I hope you and yours are doing well Ed…thanks for dropping in.